This approach will have the "Rows affected" information in the bottom of the file, but you can get rid of this by using the "SET NOCOUNT ON" in the query itself. Right click the table you want to export and select "Select All Rows"
Right click the results window and select "Save Results As..."
I wrote a small tool that does just that. Code is available on github. Dead horse perhaps, but a while back I was trying to do the same and came across a script to create a STP that tried to do what I was looking for, but it had a few quirks that needed some attention. In an attempt to track down where I found the script to post an update, I came across this thread and it seemed like a good spot to share it. This STP (Which for the most part I take no credit for, and I can't find the site I found it on), takes a schema name, table name, and Y or N [to include or exclude headers] as input parameters and queries the supplied table, outputting each row in comma-separated, quoted, csv format. I've made numerous fixes/changes to the original script, but the bones of it are from the OP, whoever that was. 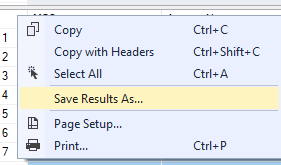 Right Click and Select "Save Results As"
Not the answer you're looking for? Browse other questions tagged sql-server database csv or ask your own question. How to dump an entire SQL Server 2014 database into a file, to be imported into a Postgres database?